Each room is air conditioned and some have a seating area. A work desk and a minibar are fitted in all accommodation. 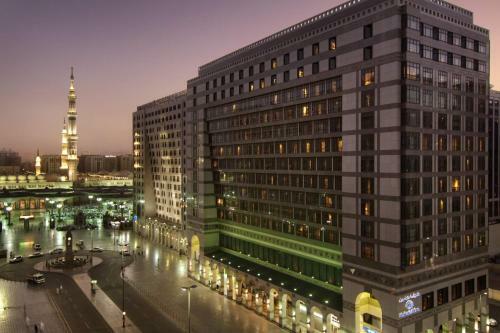 Madinah Hilton Hotel has a range of shops on the ground floor. The hotel also provides a 24-hour reception, a business centre and a tour desk. Guests can enjoy a meal of traditional Arabian delicacies in the hotel’s Madinah Restaurant while admiring the view of the Holy Mosque. Madinah Hilton offers room service as well. Prince Mohammed Airport is 25 minutes' drive away. Featuring art deco-style, this spacious and bright room has partial Haram views and a seating area. It includes slippers and mineral water. Featuring art deco-style decoration and partial views over the Holy Haram, this spacious and bright suite has a work desk, a seating area with sofa, and a marble bathroom. It includes slippers, internet access, and mineral water. Pokud rezervaci zrušíte nebo změníte do 3 dní před datem příjezdu, nebude vám účtován žádný poplatek. Pokud rezervaci zrušíte pozdě nebo do hotelu nepřijedete, bude vám účtováno 100 procent z ceny první noci. Kabelové internetové připojení je dostupné v business centru za 50 SAR na hodinu. Kabelové internetové připojení je dostupné ve společných prostorách za 50 SAR na hodinu. Bezdrátové internetové připojení je dostupné ve společných prostorách zdarma.